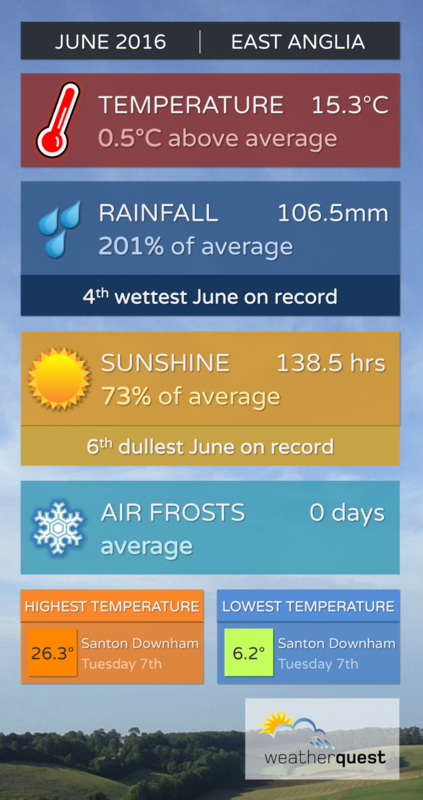 East Anglia has just experienced its 4th wettest and 6th dullest June on record, with 201% and 73% of average rainfall and sunshine respectively. This makes it the wettest month across the region since July 2012, and the wettest June since 2007. It was also the dullest June since 1990. Much of the month was dominated by slack areas of low pressure within a humid airmass, creating multiple days of slow-moving heavy showers and thunderstorms. As is often the case in showery setups, rainfall totals across the region varied quite a bit - even over relatively short distances. Much of Essex along with central/east Suffolk and southwest Norfolk received more than double the monthly average of rainfall, while parts of north Norfolk were actually close to the monthly norm. Despite the often cloudy and wet conditions, it was a relatively warm month with mean temperatures at 0.5C above average. This was primarily due to many warm, humid nights rather than particularly warm days. Santon Downham, just north of Thetford, recorded the warmest and coldest temperatures for the month, starting the morning of the 7th with 6.2C and reaching a high in the afternoon of 26.3C - an impressive diurnal range of 20.1C! 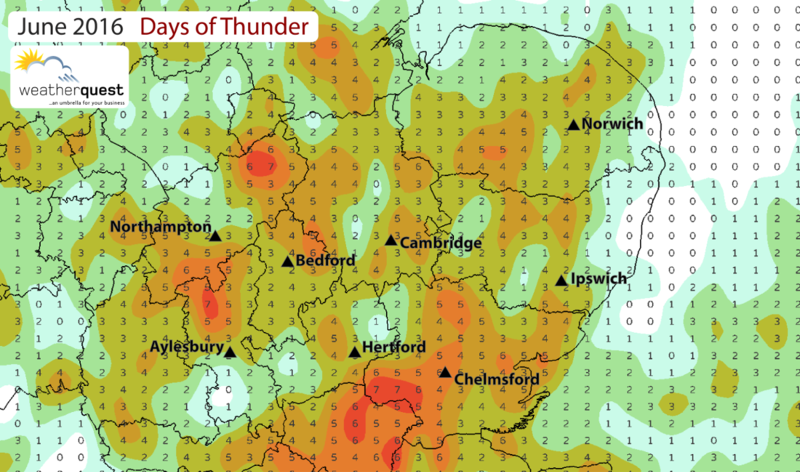 It was also a thundery month in many areas, with some parts of the region experiencing up to 7 days of thunder.